Carl Therrien is an assistant professor at Université de Montréal. He co-founded the first international conference on the History of Games and the Game History Annual Symposium in Montreal. Major publications include the opening chapter in Mark J. P. Wolf’s Before the Crash (Wayne State University Press, 2012), many entries in Greenwood’s Encyclopedia of Video Games (2012), a historical contribution in Bernard Perron’s anthology on Horror Video Games (McFarland & Company, 2009), and a recent paper on the rise of cooperative address in game design (Wiley’s Handbook of Digital Games, 2014). Documenting, understanding and transcoding the history of games into narrative form is a daunting task. Confronted with such an enormous quantity of traces, historians are naturally inclined to rely on testimonies and subjective accounts for some aspects of their narrative. As Paul Ricoeur pointed out, voluntary witnesses must be confronted with involuntary witnesses �" all the other traces �" in order to properly document, explain and format history into a proper narrative. In this paper, the first-person shooter genre and its integration in journalistic and academic accounts are inspected through a rigorous etymological study. The genre has been associated with a major cultural shift that corresponds with the release of popular titles from id Software at the beginning of the 1990s. Through an in-depth inspection of the available documents, this paper highlights the problematic cultural biases that permeate historical accounts, and demonstrates that engaging the complexity of the medium’s history can lead to strikingly different stories. In a recent New York Times feature, Daniel Engber sets out to answer the question: “Who Made That First-Person-Shooter Game?” (2014). The article celebrates the release in the early 1990s of id Software’s Wolfenstein 3D (1992) and Doom (1993), and more specifically the perspective “shift” they are said to have introduced in the video game world. “That shift changed the way that people played”, proclaims Engber, echoing John Carmack’s self-congratulatory statements quoted throughout. This is, after all, part of the “innovation” series of the journal. Video game history has been documented thanks to the availability and generosity of key historical figures to a large extent. Steven Kent’s Ultimate History (2001) builds on Leonard Hermann’s Phoenix: The Fall & Rise of Video Games (1994) with more than 500 interviews. For Replay (2010), Tristan Donovan met with more than 140 game developers and entrepreneurs. Even more specific histories such as Jamie Russell’s account of movie related games are documented through dozens of encounters (2012). When it comes to media histories, video game historians enjoy a rare luxury: they still have access to a vast amount of individuals who are willing to be interviewed, and otherwise assist in the process of documenting the evolution of the medium. But as the opening quote from Ricoeur points out, voluntary witnesses must be confronted with other relevant traces that might not be so generous with words, and whose meaning must be deciphered. Ideally, such inspections should establish the foundations for the second and third phases of any historical endeavour: to explain, and to construct appropriate narratives (Ricoeur, 2000). In 2005, Erkki Huhtamo noted that many of the journalistic accounts of video game history fall into the “chronicle era” of the discipline. According to him, such accounts fail to unearth and explain the cultural implications and lineages inscribed within the objects. A first major historical effort from academics emerged in 2003; Digital Play did address the cultural aspects of the phenomenon and their constant interaction with the circuits of technological innovation and industrial growth, albeit with obvious restrictions in terms of scope and acuity. In recent years, more scholarly attention has been devoted to understanding the cultural history of games. From 2011 onwards, The Play it Again project in Australia paved the way for the current interest in local game histories that were typically excluded from major historical accounts . At a recent symposium on game history, Tristan Donovan reflected back on the process of writing Replay, and on the necessity to integrate alternative lineages in the medium’s history (Donovan, 2015). Local and alternate lineages contribute to the maturation of the field; they allow us to confront dominant narratives and shed light on their underlying mind-set. This paper seeks to further develop our understanding of cultural biases that permeate the way video game history has been written. In spite of the critiques that will be presented, it must be acknowledged that all available accounts provide useful foundations for further research. Documenting, explaining and transcoding the history of games into narrative form is in itself a daunting task. Confronted with such an enormous quantity of traces, historians are naturally inclined to rely on testimonies and subjective accounts for some aspects of their narrative. As this paper will demonstrate, an in-depth inspection of the available documents can lead to strikingly different stories. For the sake of space and available resources, the argument will be restricted to a very specific genre, one that has attracted a lot of attention in the history of games and in scholarly efforts, and one that is commonly associated with an important shift in video game history: the first-person shooter. It represents one of the great consensus for those interested in the history of video games : enthusiasts, journalists and academics all seem to agree that Wolfenstein 3D and Doom mark a turning point. For better and for worse, FPS games quickly became the poster child of video game culture, and the genre has been increasingly present in the media landscape. The amount of products marketed with the generic label and the heavy serialisation of FPS franchises are but a few indicators of the genre’s popularity within the community, and many elements have been put forward to explain this success story. The FPS genre embodies the dedication of computer engineers to develop and refine a lifelike simulation of visual perception. It is also a privileged outlet for consequence-free violent behavior and has been at the center of moral outcries for this celebration of destruction. According to Bob Rehak, graphical sophistication and visceral action are largely accountable for the “powerful immersive effect” associated with the genre (2008, p. 187). In game studies, first-person shooters have been the focus of many contributions. Already in 2002, four chapters of the anthology Screenplay. Cinema/Videogames/Interfaces take interest in the genre. Its textual presence as the only generic label in the table of contents is rather surprising, since its visual aspect �" a continuous point of view shot, in cinematic terms �" is one of the least common in mainstream cinema. Alexander Galloway dedicated a significant portion of his Essays to the “Origins of the First-Person Shooter” (2006), and factual elements on precursors and influences are readily accessible in journalistic accounts (Donovan, 2010). More recently, The FPS became one of the only genres to be singled out as the focus of a full anthology (Voorhees et al., 2012). Discussions on the concept of avatar have found an interesting case study with first-person shooters, as one can see in Victor Navarro’s contribution (2012), in Michael Hitchens’ survey of FPS protagonists (2011), all the way back to Rehak’s contribution in the Video Game Theory Reader (2008). Here again the focus seems paradoxical: the visual presence of the avatar, in comparison with non-first-person games, is quite minimal. As the Rehak quote in the previous paragraph made obvious, the genre is often associated with the popular concept of immersion, which is commonly defined as the perceptual illusion of non-mediation. Ostensibly, the FPS genre has received a lot of historical and scholarly attention. The goal of this paper is not to discuss theoretical or psychological models of immersion or refine our factual knowledge of the genre’s history. While the introductory quote from the New York Times feature might suggest historical blindness, the questions I set out to answer were built from knowledge that is readily accessible within the gaming community. As this paper will make perfectly clear, the refinement of anthropomorphic vision and shooting scenarios merged in video game history a long time before the commercial explosion of id Software games at the beginning of the 1990s. In fact, game configurations that correspond to our modern understanding of “first-person shooter” can be traced back to traditions predating video games by decades in some aspects. In this context, one might wonder why the expression “first-person shooter” surfaced much later, what other expressions were commonly used to talk about similar game configurations, and what pressures from the encompassing game culture triggered such a change. One might also question why popular narratives of the genre history focus primarily on id’s games as a point of origin, and seek to understand the underlying cultural biases that are becoming naturalized through this selection. In short, our goal is threefold: to document the textual dissemination of the “FPS” generic label in marketing elements and in the specialized press; to explore the lineage of games associated with “first person”, “first-person shooter” and related expressions in order to reconstruct the different meanings these expressions convey in the history of games; to use this study of etymology to reflect on the current state of the genre’s historiography. Considering the goals of this project, several textual sources and games had to be inspected thoroughly. A significant timeframe to conduct the investigation has been delineated: the emergence of commercial video games in the 1970s, and the solidification of the FPS as a popular game genre (1996) . The research protocols described in this section greatly benefited from the newfound accessibility of peri/paratextual elements such as game boxes and magazines from this era; it was conducted in part in Université de Montréal’s video games lab, and in virtual repositories of game related artefacts . These repositories rely on the dedication of video game fans and amateur preservationists, who painstakingly scan old magazines and refine emulators in spite of a troublesome legal environment. In order to establish a corpus of relevant games and document the textual dissemination of the “FPS” generic label, two methods of historical inspection were devised. Drawing a line from the original textual sources to the contemporary documents that look back on the genre’s history, each method appears to run in opposite direction. First, contemporary accounts of the first-person shooter genre �" such as fan-made listings on YouTube, journalistic features, and academic books �" were reviewed. However, relying on contemporary documents discussing the FPS genre would likely provide incomplete and circular results, and a second method sought to provide a complimentary look through the chronological inspection of previews, reviews and advertisements from several video games magazines, starting in 1981 and ending in 1996. Most of the FPS listings have adopted the format of the “top” or “best of”, which originated in the printed press and proliferated on websites and on YouTube in recent years. These listings are concerned only with the epitome of the genre at the time of their publication, with relatively few nominees (typically 20 or 50); most of the titles are associated with contemporary franchises such as Call of Duty, Crysis, Half-Life, Halo, and Resistance. Initial analysis of these listings revealed very few titles from the historical timeframe under investigation; save for Duck Hunt (Nintendo, 1984) and the first System Shock (Looking Glass Studios, 1994), only Wolfenstein 3D and Doom were singled out. In this context, Wikipedia’s “List of first-person shooter games” became one of the most useful documents, with 42 titles predating Wolfenstein 3D, and 154 released prior to 1997. In the case of scholarly literature, 15 papers and book chapters with a clear emphasis on first-person shooters have been consulted. In order to unearth more contemporary associations between specific games and the FPS label, the indexes of six general-interest game studies monographs have been inspected . Major historical efforts such as Kent’s Ultimate History and Donovan’s Replay have also been included in this part of the research. 87 games identified as “first-person shooters” emerged from this inspection, and few titles released before 1997 were part of the lot. Here again and by a large margin, Wolfenstein 3D and Doom are the most common occurrences. On top of id Software games, only System Shock, Marathon (Bungie, 1994), Alien Vs. Predator (Rebellion, 1994), Descent (Parallax Software, 1995) and Duke Nukem 3D (3D Realms, 1996) were mentioned. However, many associations between older games and “first-person” have been singled out. With the corpus clearly delineated, marketing elements for each of the games were examined, either in the video game lab or online. Arcade flyers and the original boxes have been prioritized for this part of the inspection, including regional variations in many cases. These elements typically contain a lot of text; descriptions were carefully read in order to detect potential uses of the generic label, and note other similar expressions. Once new associations emerged in scholarly literature (for instance, with shooting galleries or with the dungeon crawler genre), further research was conducted on the collaborative database Mobygames; marketing elements from similar games published in the same era were reviewed. Mobygames also includes a “1st-person” keyword under the category “perspective”, and this feature allowed for a better understanding of the contemporary meanings of the expression. In order to complement the investigation of this corpus, several magazines from the specialized video game press have been inspected. Three research assistants have been asked to note occurrences of “first-person”, “FPS”, “Doom like” and their French equivalents in three long-lasting publications: Computer Gaming World (United States, 1981-2006, abbreviated CGW), Computer and Video Games (United Kingdom, 1981-2004, abbreviated C&VG), and Tilt (France, 1982-1994) . Computer Gaming World is dedicated almost entirely to games edited on personal computers, while the other two are platform agnostics. The video game lab provided scanned versions of these magazines, and the visual documents had been previously converted to a searchable file format thanks to optical character recognition. However, OCR has proven unreliable with the more unusual page setting seen in the press: fonts are often crooked, colored or treated in ways that make it impossible to decipher for the algorithms. Thankfully, research assistants were instructed to visually inspect every major feature of their magazine (such as previews, reviews and special articles) up to 1986 in the course of a broader research project on press coverage. They were able to unearth early occurrences of relevant expressions that were not picked up by the automated research. Additional magazines such as Gamepro, Video Games & Computer Entertainment, and the French Joystick have been inspected, but without the same degree of scrutiny. Since the occurrences from the press encompass a large number of reviews, previews and other articles, these features have not been included in the reference list; magazines will be quoted directly in text with all the relevant publication information. Documenting the textual dissemination of “first-person” / “first-person shooter” through these two protocols represented the first step to conduct a deeper etymological investigation. In order to fully understand the semantic shifts of these terms at any given time in the history of the medium, connections between the textual occurrences and specific gameplay components had to be understood in context. Thus, games that have been associated with the genre had to be experienced to some extent. This created a significant amount of information to process for a single researcher. Moreover, many of these games (such as mainframe games from the 1970s and electro-mechanical games) are not readily available. Consequently, firsthand experience with the original games has been supplemented with emulation and audiovisual archives. Although audiovisual traces do not provide firsthand access and are prone to many distortions (even if one only considers the audiovisual aspects), it has been argued that they represent a great resource to explore a wider scope of game history for researchers (Newman, 2012). Following this multifaceted archeological inspection, the textual dissemination of the FPS generic label has been partially documented, along with many shifts in the meaning of the term “first person”. Furthermore, a textual network of related expressions has been established; it includes expressions such as “3-D”, “perspective”, “virtual reality”, “cockpit view”, and “smooth scrolling”. The confrontation between our contemporary understanding of the FPS and the original discursive framing of the games lead to a series of problematic observations about the construction of the genre’s history. Most notably, it became clear in the course of the research that there is a contemporary tendency to associate the categories “first person” and “first-person shooter” with games that were never or rarely labelled with such terms to begin with, and that the journalistic and academic accounts of the genre history seem biased in ways that have not been acknowledged. Thanks to a proper etymological investigation and a deeper understanding of the textual network, this paper sheds light on these biases and interrogates the discursive construction of the genre history. The shifting meanings of “first-person” that surfaced throughout the etymological investigation pointed towards many design innovations in the history of games. The paper has been organized with such components in mind: each section is built from an association with “first-person / first-person shooter” found in literature, and then goes on to explore how similar objects were encapsulated by discourse. Although this account will constantly jump back and forth in time, the organization of the paper has been designed to evoke a seemingly logical and linear technological evolution, from the early developments of game visuals to the wildest aspirations associated with Virtual Reality devices. As the paper progress through this illusory reconstruction, many innovations will be presented: the advent of perspective in video game graphics, the emergence of z-axis scrolling in action games, the development of active exploration of 3D game spaces, and the ambivalence towards simple “shooting” mechanics at the time id Software games were introduced. In Guns, Grenades, and Grunts, Mark J. P. Wolf’s historical account of shooting games states that one could consider “shooting galleries on carnival fairground” as the very first examples of the FPS genre (2012b, p.26; see also p.31). Coin-operated mechanical shooting galleries have existed long before the advent of video games; there are known examples of such machines dating back as far as 1895 (Automatic shooting range, by Mechanical Trading Co.) and electromechanical shooting games flooded the arcades after the success of Shoot the Bear (Seaburg, 1947): Safari Gun (Williams, 1954), Shooting Gallery (Exhibit Supply, 1954), Periscope (Sega, 1968) are just a few noteworthy examples. Obviously, shooting galleries also predate the development of coin-operated entertainment. In a sense, these machines were played in “first-person”: pointing a fake gun at simulated targets involved the body and the eyesight in a way that is very similar to the actual experience of shooting, defined by the same basic skills of lining up a reticule with a target and timing the trigger and reload actions (Wolf 2012a, p.569). However, one would be hard-pressed to find such a description of shooting galleries in the available arcade flyers; it appears that the “first-person” nature of this experience was too implicit to be distinguished through language. In contemporary literature and databases, video game transpositions of the shooting gallery formula are commonly associated with the FPS genre. For instance, Bernard Perron refers to the FMV arcade games produced by American Laser Games as “first-person shooters” in his account of interactive movies (2008, p.129). On the Mobygames database, most shooting galleries are tagged with the keyword “1st-person” under “perspective”, and “shooter” under “theme”. Interestingly, the original arcade flyers for live-action based galleries �" from Nintendo’s Wild Gunman (1974) to American Laser Games titles �" did not single out the use of cinematic “point of view” shots in any way. While no similar expression could be found in the available arcade flyers, one notable exception was found in Tilt, where the home conversion of Operation Wolf (Taito, 1987) is described with the French equivalent (“première personne”, January 1989, No 62, p.49). In 1987, Taito’s classic used large bitmap graphics that were able to remediate perspective drawing techniques to some extent . During the 1980s, the introduction of graphical adventure games created a fascination for the increasingly faithful reproduction of classical drawing techniques in games. According to Wolf’s account of the genre in The Video Game Explosion, the graphical aspect of Hi-Res Adventure #1: Mystery House (On-Line Systems, 1980) and other early examples “did introduce a first-person perspective into the games, which helped to engage the player more and compensate for the lack of a graphical user interface” (2008, p.83). Here again, this association is corroborated on the Mobygames page for the game; “1st-person” is noted for many graphical adventure games in which the scenes are depicted following the basic rules of monocular perspective. Interestingly, many scenes in Sierra’s Hi-Res Adventure series feature a point of view situated above the typical human sightline, especially in indoors scene. The full screen drawings in The Hobbit (Beam Software, 1982) or Déjà Vu: A Nightmare Comes True (ICOM, 1985) were easy to distinguish from the typical look of games made from 2D tile sets, which was either perfectly flat or included contradictory points of view. However, no mention of “first-person” could be found on the original packaging for these games. Adventure international’s graphical adaptations of their original text adventures typically put forward the ever convenient “hi-res” technological marker, one of the most pervasive marketing tools in video game history. Following their initial series of Hi-res adventures, Sierra On-Line used “3-D animated adventure” and “Incredible 3-D graphics” frequently in the marketing of their games, for instance in the 1987 edition of King’s Quest and Police Quest. In the press, a few occurrences emerge at the turn of the 1990s: Annie Katz’s 1989 article on the “The Adventure Revolution” does mention the first-person perspective as contributing to the excitement of Déjà Vu (Video Games & Computer Entertainment no 8, September 1989, p.81). In a recurrent printed ad for the TRS-80 adventure games Asyluym, Deathmaze and Labyrinth (Med Systems), the graphical aspect is described as a “rat’s eye view” (C&VG no 2, December 1981, p.73). Natural perception is mimicked more accurately in these games thanks to a vanishing point situated at the center of the graphical depiction. The arrays of simple oblique lines and “square by square” spatial exploration are reminiscent of Coley’s mainframe game Maze War (1974), one of the earliest games associated with the FPS genre. The peculiar rodent reference can only be understood in the context of a broader discursive network. “Maze game” was a common generic label in the early 1980s, associated with arcade games such as Pac-Man (Namco, 1980), but also with textual and graphical adventure games where players had to find their way in labyrinthine spaces. Games that represented these labyrinths with monocular perspective had a very abstract quality to them that evoked the artificial maze settings used for animal testing. This also happens to be the case for early computer role-playing games �" often called “adventure” at the time �" of the dungeon crawler ilk. The dungeon scenes in Akalabeth (Garriott, 1979) and Ultima (1981) follow the basic composition rules of perspective, and feature “step by step” spatial exploration. This design choice had a lot of influence on computer RPGs over the next 20 years, with long-lasting series such as Wizardry (Sir Tech, 1981-2001), The Bard’s Tale (Interplay Productions, 1985-1988), Might & Magic (New World Computing, 1986-2002), Ishar (Silmarils, 1990-1994) and Eye of the Beholder (Westwood, 1991-1995). Although all these are often referred to as “first-person” experiences in contemporary literature and databases, most were not described as such on the original boxes and in printed ads. 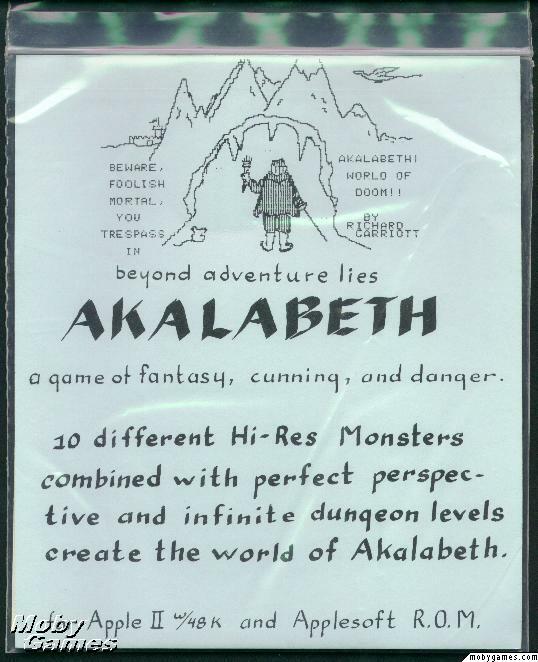 Through the Ziploc bag, Akalabeth’s cover piece brags about its “perfect perspective” (fig. 1), but the preferred expression for most of the dungeon crawler genre throughout the 1980s was “3-D”, as one can see on the back covers of the first games in the Wizardry and Might & Magic series (New World Computing, 1986). As we move closer to the 1990s, computer RPGs were more commonly described as first-person perspective games both in marketing and in the press. Following Legacy of the Ancients, The Legend of Blacksilver (Quest Soft, 1988) was sold with the promise of “Incredibly realistic first person views and 3-D effects”. In 1990, Circuit’s Edge �" a text-heavy cyberpunk role playing game created by Westwood and Infocom �" was presented as a “1st-person mystery adventure”. Xenomorph’s back cover singled out the “full first-person perspective” (Pandora, 1990), along with the outstanding graphics and animation. Some catalogue ads for Might & Magic III (New World Computing, 1991) also mentioned the first-person perspective (PC Games, September/ October 1991, p.37), even though the studio refrained from using the expression. For their landmark Eye of the Beholder series, Westwood studios decided to highlight the “3D ‘you are there’ point of view” on its lavish packages. Incidentally, many occurrences of “first-person” were found in the press for Eye of the Beholder (CGW no 81, April 1991 p. 48; CGW no 83, June 1991, p. 14), and it became customary to describe dungeon crawlers in similar terms following the game’s release. In a retrospective overview of nominees for their hall of fame feature, CGW’s team revisit many landmark entries in the genre, stating that “Dungeon Master pioneered first-person perspective role-playing with extremely high resolution graphics”, further adding “Might & Magic preceded Dungeon Master and offered a first-person view, as well” (CGW no 86, September 1991, p.128). This represents one of the consistent associations that came to be found in the course of this project. As the next section will demonstrate, this understanding of “first-person” was challenged by another common association that became prevalent in the press at the turn of the 1990s. During our inspection of dungeon crawler games, the expression “3-D scrolling” surfaced on a few occasions (The Bard’s Tale, 1985; Legacy of the Ancients, Quest Soft, 1987). “Scrolling” became a common technological feature to put forward in the context of action games such as platformers and shoot ’em ups throughout the 1980s. Nonetheless, these occurrences are surprising in the context of the dungeon crawler genre, where the “view by view” exploration of space is rather elliptical compared to vertical or horizontal scrolling games. The idea of smooth scrolling on a represented depth axis brings us closer to the active visual exploration of a 3-D space, an essential component of our contemporary FPS experience. Long before the elliptical exploration of early RPGs, video game engineers have come up with many techniques to implement this kind of visual illusion. In 1976, Atari’s Night Driver used a dynamic array of white squares to simulate driving on a sinuous road from the perspective of the driver. Arcade owners were told in the flyer that the machine “places the driver in the cockpit of his own Sebring type racer”. Night Driver was likely inspired by a similar German game, Nürburgring1, designed by Reiner Foerst (1976); the original flyer pointed out the “naturgetreuem perspektivischen” of the game, which translates to “lifelike perspective”. In this section, a strong association between “first-person” and vehicular games will be presented, along with a remarkable confusion between what is now considered third-person and first-person perspectives. In 1982, the popular Pole Position (Namco, 1982) arcade game used the “presence through perspective” rhetoric to sell the game: “computerized image in perspective gives the player the feeling he is there, at the race track”. Racing or flying games from the electromechanical era such as Sega’s Jet Rocket (1970), which already integrated steering wheels or yokes, held similar claims (fig. 2). Descriptive text in arcade flyers often took the time to highlight the novel depth effects: in Taito’s Interceptor (1976), “Enemy aircraft increase and decrease in size”; In Starhawk (Cinematronics, 1977), “ships move in all direction”. Star Wars (Atari, 1983) went one step further and associated the experience of its dynamic “cockpit view” vector display to a complete identification with the popular hero of the series: “The player becomes LUKE SKYWALKER at the controls of his X-WING fighter”. 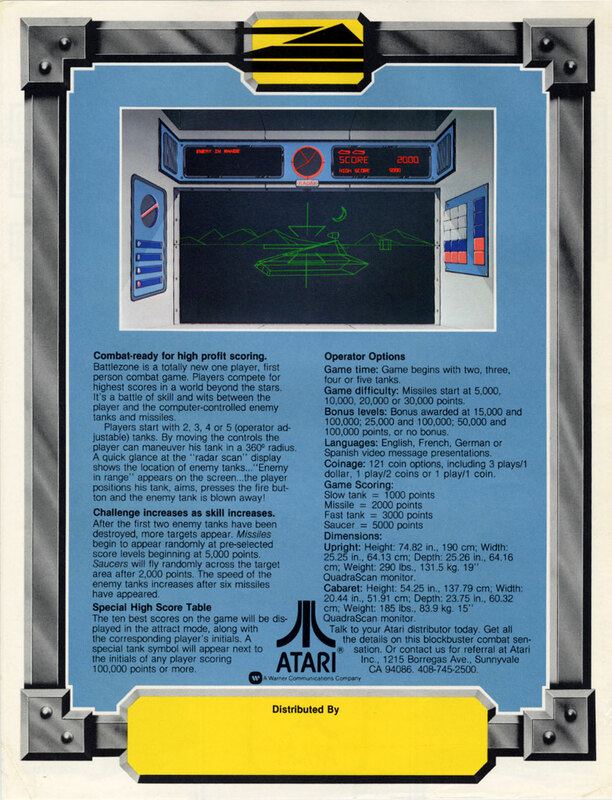 But here again, typical “pilot” games using perspective such as Starhawk and Speed Freak (Vectorbeam, 1979) were sold with “3-D” as a marker of technological attraction in the 1970s and 1980s. In 1987, a shooting game heavily inspired by Starhawk and Atari’s Star Raiders (1979) was introduced in C&VG with an early equivalent of the “first-person shooter” generic label; in 3D Galax, “Gremlin has gone one stage further and turned the 2D blast from the past, into a first person zapper that puts you in the cockpit of an experimental Astroblitz craft” (emphasis mine; C&VGno 73, November 1987, p.28). Towards the end of the 1980s, racing games and shooters that correspond more specifically to our contemporary definition of “third-person” games came to be associated with “first-person” consistently in the press. This is one of the most unexpected meanings to surface during our inspection of historical documents. In the August 1988 issue of Computer Gaming World, Sega’s classic Afterburner is presented as using “the same pseudo-first person perspective as most driving games (Pole Position, Out Run, etc. )” (no 50, p.47); in all these games, the vehicle is clearly visible at all times on the screen. Similarly, issue 87 states that Thunder Blade “is displayed in first person 3D, rather like Afterburner” (no 87, January 1989, p.22). In his EGM cover story “Next Generation Gaming”, Steve Harris describes Victory Run for the Turbografx-16 (Hudson, 1987) and Super Thunderblade (Sega, 1988) for the Genesis as “first person”, even though one can clearly see the car and chopper on the screenshots included in the article (no 2, July 1989, p.35, 37). Similar confusion also occurs outside of these classic vehicular scenarios. It was rather surprising to discover that the bicycle challenge in The Games (Epyx, 1988) is represented “as first person 3D view, from slightly behind the cyclist” (C&VG no 86, December 1988, p.63), and that the various skiing contests in Downhill Challenge (Microids, 1989) involve a “first person perspective from right behind the skier so that the player must react from the same visual perspective as the skier” (CGW no 58, April 1989, p.45-46). Even Access Software’s golf simulation Links �" in which the golfer is visible at all times �" has been presented as a first-person experience (CGW no 80, March 1991, p.10). For these journalists, the visual effect of travelling on the depth axis and the refinement of this type of illusion appears to be the decisive element to evoke a “you are there” feeling, to the extent that the visual presence of a prosthetic body on the screen became completely irrelevant. In racing games, spatial exploration is “naturally” restricted through roads and tracks, and most of the games mentioned in the opening of this section fall under the “rail shooter” category. This generic label has been used more systematically following the release of polygonal shooting games such as Panzer Dragoon (Sega, 1995) or Time Crysis (Namco, 1995), in which spatial exploration is heavily directed by the system; the action unfolds through space as if it was set up on the rails of a roller coaster. Interestingly, the expression doesn’t seem to have been used when shooting games were mostly conducted on the “technological rails” of vertical or horizontal scrolling; just like “first-person” for shooting galleries, the expression “on rails” was apparently too implicit to be expressed formally before the proliferation of polygonal game engines, and their corollary affordances in terms of spatial exploration. In the next section, I will explore how games implementing free roaming spatial exploration �" a defining element of the contemporary FPS experience �" were framed through discourse. The active exploration of a 3-D space has been implemented in game mechanics a long time before the commercial explosion of the first-person shooter genre at the beginning of the 1990s. In fact, such freedom of exploration was one of the main incentives to play vehicular simulations, and our historical investigation revealed a strong association between this genre and the “first-person” label. While other games in the genre were marketed with the ever popular “3D”,  the expression was already used in Battlezone’s arcade flyer in 1980 (Atari). In 1984, Lucasfilm’s Rescue on Fractalus proposed a “3-D flight fantasy” where gamers had to rescue fellow pilots at the command of their spacecraft. The box for the Epyx release of the game on Commodore 64 and Atari 400/800 listed the “First-person perspective in both flying and rescue sequences” as a feature, and the spiritual successor Koronis Rift (Lucasfilm, 1985) was defined as a “First person strategy and adventure”. This expression was also used in the official printed ads for the game (CGWno 25, January-February 1986, p.4.). This section documents just how deeply these simulations came to be associated with the first-person point of view. In the November 1988 edition of CGW, Lucasfilm’s Battlehawks 1942 is said to propose a “first person inside-the-cockpit view” (no 53, p.32). 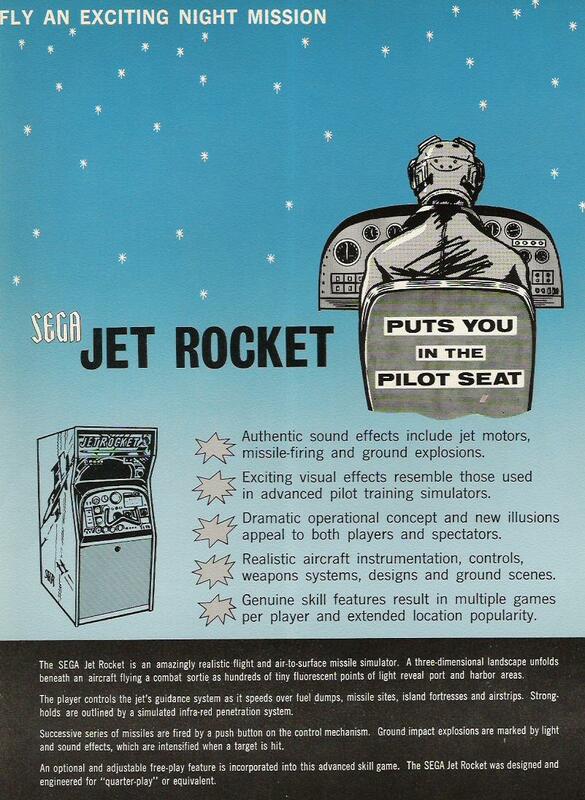 The conflation or co-occurrence of “first person” and “cockpit view” appears to have been common in both marketing and in the press for this genre. In December, a feature on the NES game R.C. Pro-Am (Rare, 1988) states a peculiar advantage of its “radio controlled” vehicular setting: “Because the player isn't pretending to be inside the car, the designers were able to do away with the over-used pseudo-first-person perspective” (emphasis mine, CGW no 54, p.65). After a few months of brainstorming, CGW introduced new categories for its hall of fame feature in April 1989. Previously, readers were invited to vote for the best “strategy” and “action adventure” games; this installment integrated “simulation”, or “Games based on first person perspectives of real world environments”, as a way to acknowledge the numerous racing and flight simulators edited on personal computers (emphasis mine, no 58, p.64). While CGW’s definition seems to highlight the importance of realism in this genre, any fantasy based vehicular game could be described in similar terms; for instance, SSI’s DragonStrike was presented as a first-person “dragon combat simulator”. In the March 1987 issue of C&VG, Mirrorsoft’s flight simulator Strike Force Harrier (1986) is praised for its ability to combine “the accuracy and realism of a pure flight simulator with the excitement of a first person combat game” (no 65, p.25; emphasis mine). Most flight simulators put a strong emphasis on aerial dogfights, and so it is not surprising to find occurrences that are so closely related to the FPS generic label in this corpus. Throughout the inspection of the press, the association between “cockpit view” and “first-person” was by far the most common and systematic . Many games have followed in Battlezone’s tank tracks; the vehicle simulation genre has been especially lucrative in the domestic computer market. As Loguindice & Barton point out, id’s FPS adventure started with a Battlezone clone: Hovertank 3D (1991) is considered to be a “testing ground for technology and concepts” that led to the landmark games (2012, p.56). The genre was thus a direct continuation of the trend set forth by Battlezone. The original control scheme of the id shooters make this observation even more obvious: the four arrow keys allowed the player to move forward / backward and to rotate the point of view. This layout is known in gamer culture as “tank controls”. In a very real sense, the visual exploration afforded to the player in these games occurred as the rotation of a machine. While the avatarial experience in video games has been theorized as a vehicle (most notably by Newman, 2002), the FPS genre as we understand it today moved beyond the vehicular setting. In the next section, I review the emergence of free-roaming 3D experiences in which players control an anthropomorphic vessel. Free roaming 3D games have emerged outside of the Battlezone vehicular enclave relatively early. 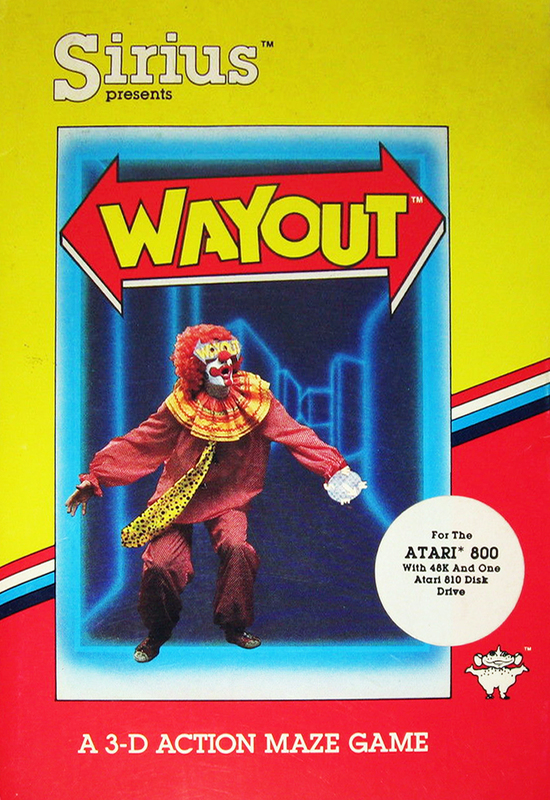 Paul Allen Edelstein’s Wayout (Sirius, 1982) proposed a very capable 3-D engine for the Atari 400/800 and Commodore 64 computers. In this maze game as well as in its 1983 sequel Capture the Flag, flat blue walls are rotated fluidly in response to user input, in front of a colorful background. The screen layout is clearly inspired by Colley’s Maze War, with the perspective view sitting on top of an overhead map. The peculiar box featured a clown figure; the human aspect of this “vehicle” becomes even more perceptible thanks to the “wayout costume glasses and compass” that were included in the package (fig.3). Even if these two games let go of the vehicular setting in favor of a “on foot” adventure, neither was described with the expression “first-person” at the time. Here again, occurrences of the generic label became more common in marketing and in the press as we move closer to the end of the 1980s, for games such as Infestation (Psygnosis, 1990; CGWno 71, May 1990, p.56) and Corporation (Core, 1991; CGWno 89, December 1991, p.70). In a discursive context where “first-person” was already associated with dungeon crawlers and vehicle simulations, software companies needed to envision another metaphor to market the innovation of these products. Thankfully, an expression was becoming quite visible in the media landscape at the time: “virtual reality”. Starting with Space Station Oblivion in 1987, Incentive Software proposed a series of science fiction games based on their polygonal Freescape engine. The studio decided to make this engine available to consumers in 1991, renaming it Virtual Reality Studio along the way; no other expression at the time could signify “being there” with such obfuscating clarity. Space Station Oblivion’s back cover bragged about the “revolutionary 3-D scaling and perspectives that change smoothly as you move around will give you the uncanny feeling that ‘you are there’”. While the on-screen interface elements made the vehicular nature of the game perfectly clear, its fictional setting justified the introduction of mechanics that went beyond the military combat and navigation implemented in simulators. For instance, the shooting mechanic is also used to interact with the environment in order to open up new passages and explore the mazes. The sequel (Dark Side, 1988) added “first-person” to a lengthy description similar to the one quoted above; players were invited to transform into a “mercenary of the future”. In Total Eclipse (1988), the player avatar is presented as a simple adventurer “traveling in a great Egyptian pyramid”. Most of the games under scrutiny in this paper have been discussed and/or sold as a three dimensional experience; “3-D” appears to be the most pervasive textual element in our network. This cultural pervasiveness is echoed in the very titles of id Software games such as Catacomb 3-D (1991) and Wolfenstein 3D. However, the marketing of these games makes it obvious that the VR craze was spreading rapidly at the beginning of the 1990s. 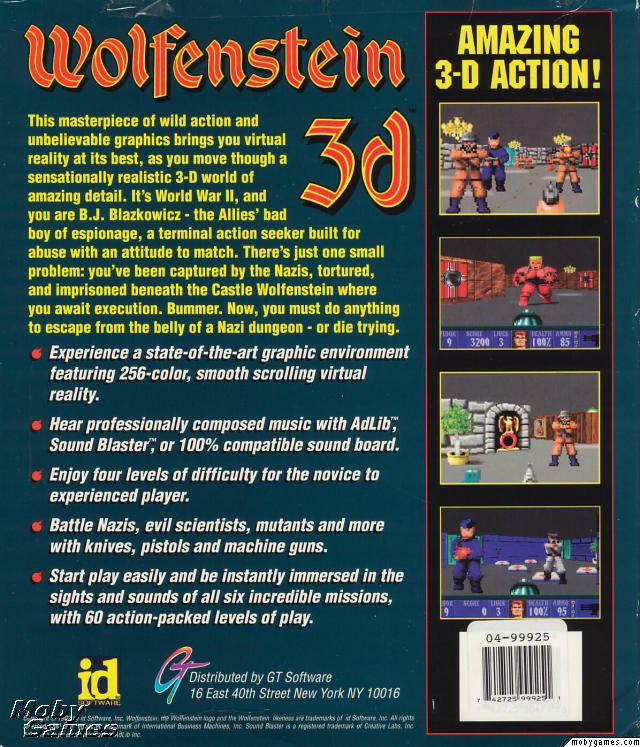 Wolfenstein 3-D was described as “smooth scrolling virtual reality, as you move through a sensationally realistic 3-D world of amazing detail” (fig.4). Doom was also presented as a virtual reality experience (Loguidice & Barton, 2009, p.58). The buzzword was everywhere in the early 1990s. Computer Gaming World dedicated three pages to introduce its readers to the phenomenon (“Game Technology for the Near and Far Future”, no 72, July 1990, p.24-26-78). Battlezone was retrospectively called “Virtual Reality for a quarter” by Wired magazine. To this day, the FPS genre is commonly associated with VR. The illusion of “being there” as a prosthetic body has been refined with many signs taken directly from the world of movie-making: in Corporation and Doom, the point of view shifts up and down to evoke the act of walking, and recent first-person games integrate perceptual distortions to signify pain or death. Our contemporary fascination with id Software games comes in part from the integration of even more bodily matters: in these classics, red pixels burst out of antagonists under the player’s fire. In the next section, I will explore the paradoxical stance towards simple shooting mechanics at the time id Software marketed their landmark games. At this point, it is clear that many games that are described as “first-person” in contemporary sources were not referred to as such at the time of their release. Similarly, many of the objects associated with the “first-person shooter” generic label nowadays were not initially described as “shooters”. While the commercial explosion of the first-person shooter genre was triggered by the release of id Software games at the beginning of the 1990s, it came as a surprise to find out, in the course of this research, that the company’s marketing efforts used just about every term in our textual network except “first-person shooter”. Considering that many similar expressions did surface before the release of these games, the omission is even more striking. In this section, I present contextual elements that explain why studios refrained from using the “shooter” label at the turn of the 1990s. In 1980, the Battlezone flyer promised a “totally new” experience of “first person combat”. Considering the popularity of shooting games even before Space Invaders (Taito, 1978), the choice of “combat” to describe the tank simulator is rather is surprising. Shooting mechanics were already so common that Atari engineers conceived the graphic architecture of the VCS console around “player-missile graphics” (Bogost & Montfort, 2009). The most probable explanation comes from the mechanical similarity between Battlezone and Combat (Atari, 1977), the VCS pack-in adaptation of Kee Games’ Tank (1974). The expression “Realistic 3-D playing field” was clearly visible on the cover of the flyer, while “First person combat” appeared in a lengthy text inside the document (fig. 5). In this context, and considering the restricted audience for this type of advertisement, it is not surprising that the expression did not spread in the community at the time. In a CGW special feature, Chris Crawford discusses a game pitch he imagined with Ted Frye at Atari, and that was meant to be a “First Person Firing Squad” (June-July 1985, vol. 5 no 3, p.20). As Steven L. Kent reports (2001, p.163), a design aid document circulating at the company in 1979 listed “first person Space Invaders” among other game pitches; this is the idea that inspired Dave Theurer to create Tempest (1981). It is one of the earliest uses of an expression that can be directly equated with “first-person shooter” (even though the game corresponds to a third-person shooter, by contemporary standards). Vertical and horizontal shoot ’em ups remained a major genre throughout the 1980s. However, many of the critically acclaimed games that were mentioned throughout this paper integrated shooting action along a variety of other mechanics, in strikingly hybrid scenarios. Koronis Rift was described as a “First person strategy and adventure”; it involved investigating shipwrecks and collecting items alongside the crosshair shooting action. Space Station Oblivion instructed players to position a drill in each level and to neutralize the deadly security systems through the activation of mechanisms in the environment. As CGW reports, Corporation has been called "Dungeon Master in space" (no 89, December 1991, p. 70); armed confrontation is certainly a major part of the experience, but players must use lock picks and hack computers in order to progress. This diversity of action is also present in early id games; it might explain the company’s reluctance to market these games with the term “shooter”. A printed ad for Doom in the French Tilt does focus on the tremendous violence of the game, promising “hell for a hundred francs” (“l’enfer pour 100 francs”; No 122, December 1994, p.50). But a more general overview of the marketing reveals that the company favored expressions such as ”amazing 3-D action!” (Wolfenstein 3D) and “first person perspective adventure” (Doom). The PC Gamer quote on the Quake box (1995) evokes an “atmospheric 3-D action game”. Most of these games integrated navigation, activation of mechanisms in the environment, and minimal equipment handling through the plurality of guns and ammo. Of course, the shooting mechanics �" and the corollary integration of evermore “splattery” bodily matters �" took center stage in the experience, and the packaging and ads often insisted on the firepower and deadly weapons. This might explain why the press and community at large started referring to them systematically as “first-person shooters” before any marketing department did. In another paradoxical turn of events, the first two mentions that were found in the press (CGW no 124, November 1994, p.108; CGW no 126, January 1995, p.92) do not point towards anthropomorphic vessels: Descent and Quarantine (Imagexcel, 1994) correspond to vehicular games. In the mid-1990s, many landmark games in the genre still used “3-D” instead of “first-person” (Descent, Parallax Software, 1994; Duke Nukem 3D, 3D Realms, 1996). Duke Nukem 3D was presented as a “3D shoot ’em up” in Gamespot’s review (1996); the C&VG review notes the influence from Doom, “meaning that it's a first-person perspective 3D action shoot-'em-up with some searching/puzzle elements” (no 171, February 1996, p.87). The expression “first-person shoot ’em up” was commonly used throughout 1996, for a variety of titles including the vehicular game Tunnel B1 from Neon Software (C&VG no 176, July 1996, p.42), Rare’s classic movie adaptation Golden Eye (C&VGno 176, July 1996, p.87) and Exhumed (C&VG no 178, September 1996, p.72). The earliest occurrence appears in a preview of Bethesda’s The Terminator (1990), a “first-person perspective search and shoot 'em up game” (CGW no 87, October 1991, p.6); the journalist compares the product to Hoverforce (Astral Software, 1990), another vehicular game. In 1995, Terminator: Future Shock (Bethesda) was one of the first games to integrate the “mouse look” visual exploration now standard in most first-person games. While Tal Belvins underscores the “hulking mass of first person shooters” in the Gamespot review of the game (1996), the categorization used by the French magazine Joystick speaks volumes: when it comes to genre, the game is simply labelled “Doom/Aventure” (no 68, February 1996, p.95). More than 60 instances of “Doom like”, “Doom alike” and “Doom clone” could be found between 1993 and 1996 in CGW and C&VG. A recent lexical analysis of chat sessions on Usenet confirms the slow adoption of the expression in gaming culture: “first-person shooter” replaced “Doom-clone” only in the second half of the 1990s . This process appears to have been very gradual. The widespread adoption of the expression in video game press and marketing occurred as the genre proliferated in the 1990s. It is thus a direct consequence of the genre’s popularity; the proliferation of similar experiences made “first-person shooter” a convenient generic label for communication and marketing in gaming culture, and concurrently, other experiences with similar visual design became more likely to be described as “first-person”. The etymological investigation that has been conducted in this paper could have explored other media practices in order to document even more early occurrences, related expressions and shifts in meaning. Our step by step illusory reconstruction of the FPS experience and its discursive framing brought forward connections with terms that have been used extensively in media and art history, such as “perspective”, “3-D”, “simulator” and even “virtual reality”. In 1968, Ivan Sutherland described the first major head-mounted display VR system at the AFIPS Fall Joint Computer Science conference. In the corresponding paper, the expression “first-person” is nowhere to be found; rather, the engineer discusses the technological underpinnings of his “dynamic perspective display” (Sutherland, 1968, p.759). In 1991, Howard Rheingold presented Morton Heilig’s Sensorama prototype from the early 1960s as one of the first VR experiments. The device would have proposed a multimodal illusion of a ride in the streets of New York City, “simulating an actual, predetermined experience in the senses of an individual” (patent documentation, 1962, p.1). Even before these multimodal experiments, the cinematic apparatus had been described as very lifelike and engaging from the earliest reports in the press. Christian Metz theorized the engagement of moviegoers with this illusion through the concept of “primary identification” (1977), an expression that echoes “first person” semantically. Galloway explores this cinematic lineage extensively in his chapter on the “Origins of the First-Person Shooter” (2006). Many more relevant lineages from literature and art history could help us shed light on the discursive practices at play. In this final section, the results of our etymology are discussed further in order to reflect on the historiography of the FPS genre. One of the most surprising findings of the research presented in this paper comes from a somewhat trivial realization: in the majority of accounts and databases mentioned in this paper, “first-person” is associated with the visual configuration of games, often directly with the concurrent expressions “perspective” and “point of view”. In a very real sense, video games are still apprehended and formatted with a pictorial/cinematic mindset through language. One might wonder why the expression “first-person experience” never became prevalent in gaming vernacular, especially considering the popularity of mimetic interfaces such as guns and steering wheels, the “drag and drop” mouse control of Déjà Vu and similar adventure games, and the dissemination of VR marketing. Only two occurrences in the press sought to evoke an experience beyond visuality: an advertisement for Alturas Corporation’s MAXX yoke �" to be used with flight simulators �" promises “first person simulation” (CGWno 44, February 1988, p. 34); Bethesda’s Terminator game is associated with “first-person immediacy” (CGW no 85, August 1991, p. 82). The obvious “hands-on” nature of the control for vehicular games with mimetic interfaces might explain the apparent confusion between first-person/third-person that was noted earlier. Afterburner or Thunder Blade are described as “third-person” games nowadays, but they occur in “first-person” when one focusses on the controls instead of the view. Interestingly, Chris Crawford presented in 1985 a distinction between first-person and third-person that corresponds to our modern understanding of the terms (CGW vol. 5 no 3, June/July 1985, p.20). The fascination for perspectival illusions in a dynamic and interactive context was apparently powerful enough to overlook the early guidelines from this most respected of developers. The confusion between the two expressions still occurs in contemporary academic literature and video game press . As this paper made perfectly clear, usage of the expressions “first-person” / “first-person shooter” occurs retrospectively on many objects that were not referred to in the exact same terms. This revisionist attitude clashes with narratives of the genre’s history. The historiographical paradox is remarkable: one the one hand, the popularity of the FPS genre has triggered a hunt for precursors; on the other, historical accounts reinforce the idea of a clear shift in the early 1990s that correspond to the true origins of the genre. This clear shift is not only typical of the glorifying journalistic accounts, such as the one from the New York Times quoted at the beginning of this paper. In “Spectacle of the Deathmatch”, Bruce and Rutter state that “The FPS story begins for the PC with id in 1992” (2002, p.67). Bob Rehak in The Video Game Explosion integrates the idea of a clear shift in the ever convenient biological metaphor: “If 1992 marked the birth of the FPS, 1998 saw its maturation” (2008, p.193). “The early FPS genre […] was a recipe for success invented largely on the back of id Software’s now legendary Doom”, according to the introduction of the monograph dedicated to the genre (Voorhees et al., 2012, p.2). Doom is a common starting point or highlight of these genealogies �" it is the stated focus of a chapter in both Ultimate History (Kent, 2001) and Vintage Games (Loguidice & Barton, 2009). Id games become the focal point in a strikingly linear account, acting both as a telos for precursors that will now be inspected mostly in relation to this lineage, and as an archè for the current cultural pervasiveness of franchises such as Halo and Call of Duty. The authors of Digital Play approach the genre’s history in a safer way. Their historical account states that “Wolfenstein was the first ‘first-person shooter’” (2003, p.143); here the quotes make it clear that they are evoking the emergence of the generic label, rather than the ludic form. However, as our etymological investigation has made perfectly clear, the studio refrained from using such an expression at first, and similar generic labels have emerged before the advent of id Software. Furthermore, we have seen that many earlier titles propose very similar gameplay configurations, including Capture the Flag in 1983, Space Station Oblivion in 1987, Corporation in 1990 and The Terminator in 1991, and one could add many vehicular shooters to this list. If id Software games were not widely described with the expression “first-person shooter”, and that many prior games proposed similar gameplay configurations, how are we justified to give such historical significance to these games? The distinctive aspect of id titles came in great part from the speed of the navigation in textured spaces, and the splattery visual consequences of the shooting action. Technological excellence and visceral action can explain the commercial success and visibility of these titles to a large extent. By according so much space and attention to these games, going so far as to place them at the focal point of a clear-cut periodization, journalistic and academic accounts structurally echo the glorifying narratives that emerge from the industry and the specialized press. The “birth of the FPS” scenario carries “exacerbated technological violence” and “commercial success” as implicit selection criteria, and consequently, take part in a widespread culture of techno-industrial glorification (Therrien and Picard, 2014). If such criteria are to be put forward in historical constructions, they should at the very least be acknowledged more clearly. In The Virtual Window (2006), Anne Friedberg proposed a broad historical overview of our relationship with framed images. Friedberg was very sensitive to the textual manifestations of concepts such as “perspective” in history, and presented numerous conceptual “lenses” from philosophers that allow us to see more clearly how the world of media has been “framed” for our understanding. In her account of perspective in Alberti’s writings, she noted that historical doxa until very recently insisted on a clear “shift” in favor of this technique during the Renaissance; other pictorial strategies such as polyscenic paintings were seen as a residual mistake, “a carry-over from earlier systems of representation” (2006, p.36). Following Lew Andrews, Friedberg pointed out that these paintings might in fact have been more prominent after the introduction of linear perspective. While the “lens” that have been used in this paper don’t have the exact same functions as those put forth by Friedberg in this major contribution, the study of etymology appears to be an essential tool to “defuse” the glorifying discourse that so commonly surfaces in business journalism and interviews. Moreover, a clear parallel can be drawn between Friedberg’s account of perspective and the tendency to create clear-cut periods and “shifts” in video game history. Throughout this paper, it is easy to see that the “birth of the first-person shooter” scenario presented in the New York Times feature leads to a tendency to iron out any element that contradicts the narrative, while the contemporary fascination with the genre leads to historical distortion, giving importance to previous objects �" very specific aspects of these objects �" that were not directly part of the lineage. Considering the findings of this investigation, it is rather disheartening to see this type of construction spread in journalistic and academic accounts. At the center of such historical constructions lies a problematic distortion cycle : historical narratives influence what is seen as worthy of preservation by any given culture, and thus have a direct impact on the documentation that future historians will have access to when they try to inspect, explain and narrate the past. One might observe that such a period-based account of video game history, focussing on technological innovation and industrial growth, feeds into a specific ideology of time �" a chronosophy (Ricoeur, 2000) obsessed with “progress” �" that unsettlingly becomes complicit in the context of an entertainment industry defined by destructive innovation (Kline et al., 2003), supersession and obsolescence (Newman, 2012). Hopefully, similar research on video game historiography can highlight the community’s tendency to “buy into” these rhetorical strategies, and contribute to the emergence of alternative accounts that will prevent the distortion cycle from spinning into self-fulfilling prophecies, and self-destroying origin myths. This research was supported by FRQSC (Fonds de Recherche du Québec �" Société et Culture) and by LUDOV (videogames observation and documentation university Lab; www.ludov.ca). Arsenault, D. (2009). Video Game Genre, Evolution and Innovation. Eludamos, Vol. 3, no 2, p. 149-176. Bogost, I. & Montfort, N. (2009). Racing the Beam. Cambride : The MIT Press. Bryce, J. and Rutter, J. (2002). Spectacle of the Deathmatch: Character and Narrative in First-Person Shooters. In G. King and T. Krzywinska (eds. ), Screenplay. Cinema/Videogames/Interfaces. London: Wallflower Press, p. 66-80. Collective. List of first-person shooter games. Wikipedia. Retrieved September 12, 2015. Donovan, T. (2015). Rewriting History: Keynote address to the 2014 Game History Annual Symposium, Montreal. Cultural History of Video Games, Kinephanos special issue, June 2015. Retrieved December 2, 2015. Egenfeldt-Nielson, S., Heide Smith, J. & Pajares Tosca, S. (2008). Understanding Video Games: The Essential Introduction. New York: Routledge. Friedberg, A. (2006). The Virtual Window. From Alberti to Microsoft. Cambridge: The MIT Press. Galloway, A. (2006). Gaming. Essays on Algorithmic Culture. Minneapolis: University of Minnesota Press. Heilig, M. (1962). Sensorama Simulator Patent documentation. Available online : http://www.mortonheilig.com/SensoramaPatent.pdf. Retrieved September 12, 2015. Hermann, L. (1994). Phoenix: The Fall & Rise of Video Games. Rolenta Press. Hitchens, M. (2011). A Survey of First-person Shooters and their Avatars. Gamestudies, Vol. 11, no 3. Retrieved September 12, 2015. Huhtamo, E. (2005). Slots of Fun, Slots of Trouble. An Archaeology of Arcade Gaming. In J. Raessens & J. Goldstein (eds. ), Handbook of Computer Games Studies. Cambridge: The MIT Press, p. 3-22. Järvinen, A. (2002). Halo and the Anatomy of the FPS. in Gamestudies, Vol. 2, no 1. Retrieved September 12, 2015. King, G. and Krzywinska, T. (2005). Tomb Raiders and Space Invaders. Videogame Forms and Contexts. London: I.B.Tauris. Kent, S. L. (2001). The Ultimate History of Video Games. New York : Three Rivers Press. Kline, S., Dyer-Witheford, N. & de Peuter. G. (2003). Digital Play : The Interaction of Technology, Culture, and Marketing. Montreal: McGill Queen’s. Konzack, L. (2008). Video Games in Europe. In M. J. P. Wolf (ed. ), The Video Game Explosion. A History from PONG to PlayStation and Beyond. Westport: Greenwood Press, p. 203-210. Loguidice, B. and Barton, M. (2009). Vintage Games. An Insider Look at the History of Grand Theft Auto, Super Mario, and the Most Influential Games of All Time. Burlington: Focal Press. Mactavish, A. (2002). Technological Pleasure: The Performance and Narrative of Technology in Half-Life and Other High-Tech Computer Games. In G. King and T. Krzywinska (eds. ), Screenplay. Cinema/Videogames/Interfaces. London: Wallflower Press, p. 33-49. McMahan, A. (2003). Immersion, Engagement, and Presence: A Method for Analyzing 3-D Video Games, in M. J. P. Wolf & B. Perron (eds. ), The Video Game Theory Reader. New York: Routledge, p. 67-86. Meer, A. (2012). The 39 best ever first-person shooter games. PC Advisor, (August). Available online : http://www.pcadvisor.co.uk/. Retrieved September 12, 2015. Metz, C. (1977). Le significant imaginaire. Psychanalyse et cinéma, Paris: Union Générale d’Éditions. Morris, S. (2002). First-Person Shooters �" A Game Apparatus. In G. King and T. Krzywinska (eds. ), Screenplay. Cinema/Videogames/Interfaces. London: Wallflower Press, p. 91-97. Morris, S. (2003). WADs, Bots and Mods : Multiplayer FPS Games as Co-creative Media. Proceedings of the DiGRA 2013 Conference. Retrieved September 12, 2015. Navarro, V. (2012). I Am a Gun: The Avatar and Avatarness in the FPS. In G. A. Voorhees, J. Call and K. Whitlock (eds. ), Guns, Grenades, and Grunts: First-Person Shooter Games. New York: Bloomsbury Academic, p. 63-88. Newman, J. 2002. The Myth of the Ergodic Videogame. Some thoughts on player-character relationships in videogames. Game Studies, Vol. 2, no 1. Retrieved September 12, 2015. Newman, J. (2008). Playing With Videogames. New York: Routledge. Perron, B. (2008). Genre Profile: Interactive Movies. In M. J. P. Wolf (ed. ), The Video Game Explosion. A History from PONG to PlayStation and Beyond. Westport: Greenwood Press, p. 127-133. Pinchbeck, D. (2007). Counting barrels in Quake 4: affordances and homodiegetic structures in FPS worlds, in Situated Play, Proceedings of DiGRA 2007 Conference. Retrieved September 12, 2015. Pinchbeck, D. (2009a). An Analysis of Persistent Non-Player Characters in the First-Person Gaming Genre 1998-2007: A Case For the Fusion of Mechanics and Diegetics. Eludamos, Vol. 3, No. 2, p. 261-279. Pinchbeck, D. (2009b). Shock, Horror: First-Person Gaming, Horror, and the Art of Ludic Manipulation. In B. Perron (ed. ), Horror Video Games. Essays on the Fusion of Fear and Play. Jefferson: McFarland, p. 79-94. Rehak, B. (2008). Genre Profile: First-Person Shooting Games. In M. J. P. Wolf (ed. ), The Video Game Explosion. A History from PONG to PlayStation and Beyond. Westport: Greenwood Press, p. 187-193. Rheingold, H. (1991). Virtual Reality. Summit Books. Ricoeur, P. (1983). Temps et récit I. Paris : Seuil. Ricoeur, P. (2000). La mémoire, l’histoire, l’oubli. Paris : Seuil. Russell, J. (2012). Generation Xbox: How Videogames Invaded Hollywood. East Sussex: Yellow Ant. Stuckey, H., Swalwell, M., Ndalianis, A. and de Vries, D. (2012). Remembering and Exhibiting Games Past: The Popular Memory Archive. Proceedings of the DiGRA Australia conference. Sutherland, I. E. (1968). A head-mounted three dimensional display. Proceedings of the AFIPS Fall Joint Computer Conference. Thompson Books, p. 757-764. Therrien, C. and Picard M. (2014). Techno-industrial celebration, misinformation echo chambers, and the distortion cycle. An Introduction to the History of Games International Conference proceedings. Kinephanos special issue, January 2014. Retrieved December 2, 2015. Voorhees, G. A., Call J. and Whitlock, K. (eds.) (2012). Guns, Grenades, and Grunts: First-Person Shooter Games. New York: Bloomsbury Academic. Wolf, M. J. P. (2008). Genre Profile: Adventure Games. In M. J. P. Wolf (ed. ), The Video Game Explosion. A History from PONG to PlayStation and Beyond. Westport: Greenwood Press, p. 81-88. Wolf, M. J. P. (2012a). Shooting Games. In M. J. P. Wolf (ed. ), Encyclopedia of Video Games. Westport: Greenwood / ABC Clio Press, p. 569-572. Wolf, Mark J. P. (2012b). Shooting Games. In G. A. Voorhees, J. Call and K. Whitlock (eds. ), Guns, Grenades, and Grunts: First-Person Shooter Games. New York: Bloomsbury Academic, p. 25-40. For more information : http://playitagainproject.org/. See also Stuckey et al. (2014). According to the “List of first-person shooter games”, at least 40 games were released in 1995, and 36 games in 1996). This part of the research was conducted in part by Hugo Montembault in the course of a funded research project on game genres and discourse communities. For more information: http://www.ludov.ca/en/observation/video-game-genres-and-discourse-communities. The Video Game Theory Reader (2003), Digital Play (2003), Playing With Videogames (2008), Tomb Raiders and Space Invaders (2005), Understanding Video Games: The Essential Introduction (2008), The Video Game Explosion (2008), The Encyclopedia of Video Games (2012). This part of the project could not have been completed without the dedication of Anthony Colpron, Mikaël Julien and Alexandre Poirier. Some issues of C&VG from 1994 were not available, and thus couldn’t be inspected for this research. Another occurrence was found in a preview of Light Phaser games for the Sega Master system, but only for one specific shooting gallery that also uses Sega’s stereoscopic glasses: Missile Defense 3-D (CGW, no 48, June 1988, p. 42). A similar description was found about Ubisoft’s Zombi (CGW no 78, January 1991, p.59). In CGW no 86 (September 1991), a preview for The Adventures of Willy Beamish (Dynamix) states that the creator “originally expected the interface to be handled from a first-person perspective, just like Rise of the Dragon and Heart of China” (p. 14). The printed ads and packaging of Stellar 7 (Damon Slye, 1983) or Sherman M4 (Loriciel, 1989) put forth their outstanding 3-D graphics, made with wireframe and polygonal 3-D respectively. See CGW no 61, p. 4; no 65, p. 25; no 68, p. 22; no 70, p.50; no 74, p.74; no 77, p. 22. Sega’s Space Tactics (1980) and Nintendo’s Radar Scope (1979) clearly copied the formula that inspired Tempest, but their respective flyers preferred to brag about “real-life 3-D” and “perspective effect”. This occurrence of “first-person” was found on the back cover of the Australian release. For instance, Hitman (IO Interactive, 2000) has been called a “3-D first person stealth game” (Konzack, 2008:208), and many “best first-person shooters” lists include third-person shooters (Meer, 2012) such as the Max Payne series (Remedy).